Brett Moist/ for the Northwest Herald Cary Grove's Micheal Arenberg and Crystal Lake South's Orlando Tapia go for the ball during the 2nd half of their Regional Semi final match at Crystal Lake South on Wednesday. 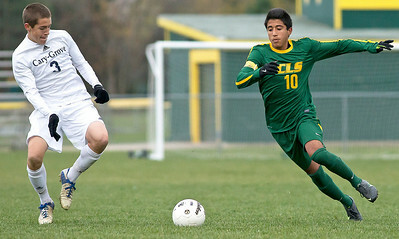 Crystal Lake South defeated Cary Grove 3-2 in Overtime. Brett Moist/ for the Northwest Herald Cary Grove's Matt Scott hits the ball with his head past Crystal Lake South's Stefan Harris during the 1st half of their Regional Semi final match at Crystal Lake South on Wednesday. Crystal Lake South defeated Cary Grove 3-2 in Overtime. 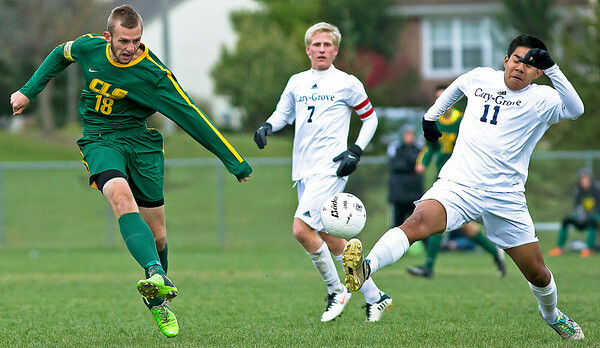 Brett Moist/ for the Northwest Herald Crystal Lake South's Gary Sexson kicks the ball past Cary Grove's Israel Lopez during the 1st half of their Regional Semi final match at Crystal Lake South on Wednesday. 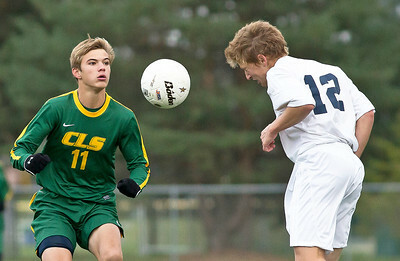 Crystal Lake South defeated Cary Grove 3-2 in Overtime. Brett Moist/ for the Northwest Herald Cary Grove's Joey Klawitter hits the ball with his head past Crystal Lake South's Andrew Perrine during the 1st half of their Regional Semi final match at Crystal Lake South on Wednesday. 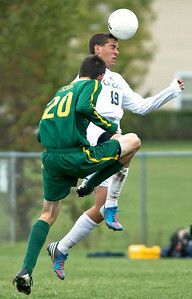 Crystal Lake South defeated Cary Grove 3-2 in Overtime. 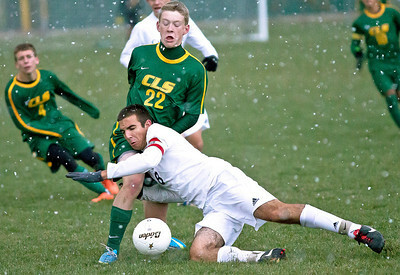 Brett Moist/ for the Northwest Herald Crystal Lake South's Andrew Perrine fights for the ball with Cary Grove's Danny Kinnerk during the 1st half of their Regional Semi final match at Crystal Lake South on Wednesday. Crystal Lake South defeated Cary Grove 3-2 in Overtime. Brett Moist/ for the Northwest Herald Cary Grove's Tyler Szydlo dives into Crystal Lake South's Andrew Grabowski in attempt to kick the ball during the 2nd over time period of their Regional Semi final match at Crystal Lake South on Wednesday. Crystal Lake South defeated Cary Grove 3-2 in Overtime. Cary Grove's Joey Klawitter hits the ball with his head past Crystal Lake South's Andrew Perrine during the 1st half of their Regional Semi final match at Crystal Lake South on Wednesday. 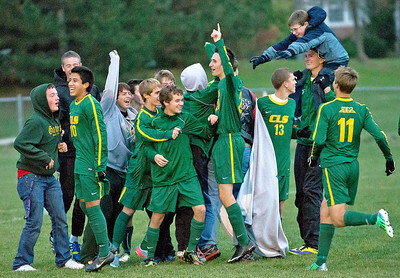 Crystal Lake South defeated Cary Grove 3-2 in Overtime.